Decibullz top rated DIY Thermo-ﬁt Molded Earpieces combined with percussive ﬁlter technology. The NEW Decibullz Custom Molded Percussive Filters protect users from the peak sound pressure of gun shots, artillery ﬁre and explosions, suppressing them to safe levels and protecting users from potential long term hearing damage. Developed for shooting and military use, the Decibullz Percussive Filters feature optimum protection from high level impulse and percussive sounds. The ﬁlters are ANSI IPIL certiﬁed up to 166 dB. When no damaging noise is present, the Decibullz Filters provide a low attenuation, permitting voice and ambient noise to be heard. The allows for situational awareness not provided by traditional hearing protection. Shaping the Decibullz Thermo-ﬁt Earpieces is easy. Simply warm the earpieces in water and shape them to your ears. If the desired ﬁt is not achieved the ﬁrst time the earpieces can be re-heated and re-shaped. Unlike electronic hearing protection the Decibullz Percussive Filters retain sound directionality and spatiality, this is crucial in hunting and combat situations. The ﬁlters also allow air to enter the ear decreasing ear canal irritation. Combined with its small size and Decibullz Thermo-ﬁt molded earpieces the ﬁlters are ideal for all day use and easily ﬁt under communications headsets and earmuffs. IMPULSE PROTECTION: Decibullz top rated DIY Thermo-ﬁt Molded Earpieces combined with percussive ﬁlter technology. 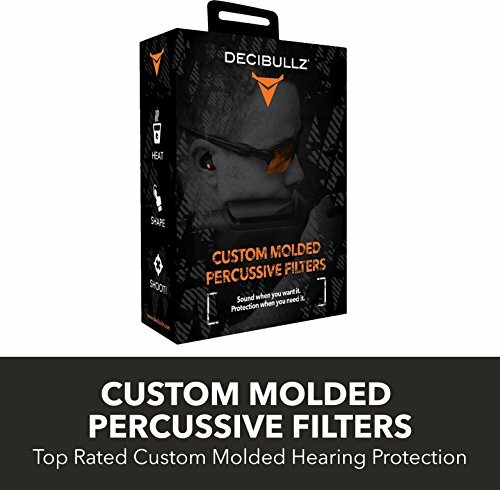 The NEW Decibullz Custom Molded Percussive Filters protect users from the peak sound pressure of gun shots, artillery ﬁre and explosions, suppressing them to safe levels and protecting users from potential long term hearing damage. SOUND WHEN YOU WANT IT, PROTECTION WHEN YOU NEED IT: Developed for shooting and military use, the Decibullz Percussive Filters feature optimum protection from high level impulse and percussive sounds. The ﬁlters are ANSI IPIL certiﬁed up to 166 dB. When no damaging noise is present, the Decibullz Filters provide a low attenuation, permitting voice and ambient noise to be heard. The allows for situational awareness not provided by traditional hearing protection. NO BATTERIES: Decibullz Percussive Filters use a physical percussive/ impulse ﬁlter providing superior hearing protection with no need for batteries. This means Decibullz Impulse Filters are always ready to protect you when you need them. CUSTOM COMFORT: Decibullz Custom Molded Earpieces are easily and quickly shaped by the user to the exact shape of their ears creating a noise isolating earplugs that is secure and comfortable. Decibullz earpieces are re-moldable. IDEAL FOR ALL DAY USE: Unlike electronic hearing protection the Decibullz Percussive Filters retain sound directionality and spatiality, this is crucial in hunting and combat situations. The ﬁlters also allow air to enter the ear decreasing ear canal irritation. Combined with its small size and Decibullz Thermo-ﬁt molded earpieces the ﬁlters are ideal for all day use and easily ﬁt under communications headsets and earmuffs. If you have any questions about this product by Decibullz, contact us by completing and submitting the form below. If you are looking for a specif part number, please include it with your message.